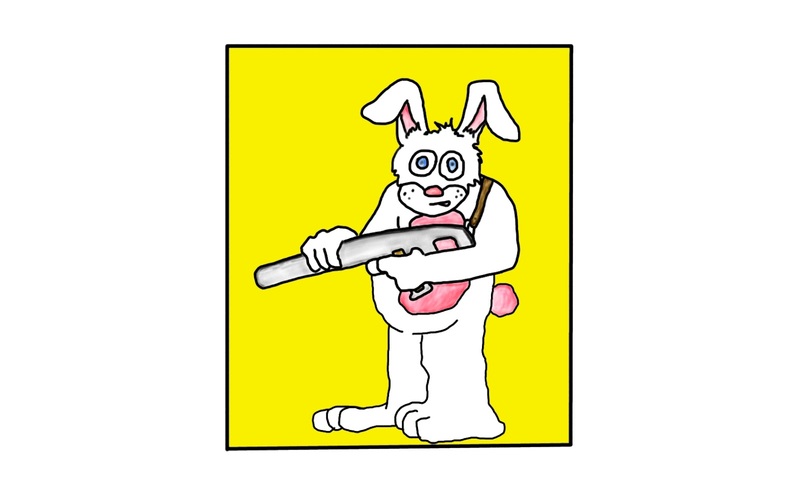 Today, you all get a bunny holding a rifle. Because, reasons, that's why. This morning was really strange. I woke up at four, and had to use the bathroom, then didn't really go back to sleep. I just had that restless, sort of in and out of consciousness thing going on. finally, once I pulled myself up and out and got dressed, I was still really out of it. My poor kid is still slugging away at a bad cold, and was all wrapped up in a ball, when I woke her up. I ended up almost falling asleep again while my wife wrapped up the daily beauty requirements in the bathroom. Then it was the big rush to get a coat on the child, and get out of the house to park on the freeway again. When I think back to it, I get the theme song to office space stuck in my head. That little salsa dance music while they are stuck in traffic. I just am not feeling the funny today, so instead I drew you a rabbit. I hope you enjoy it, as much as I did making it. More better tomorrow.